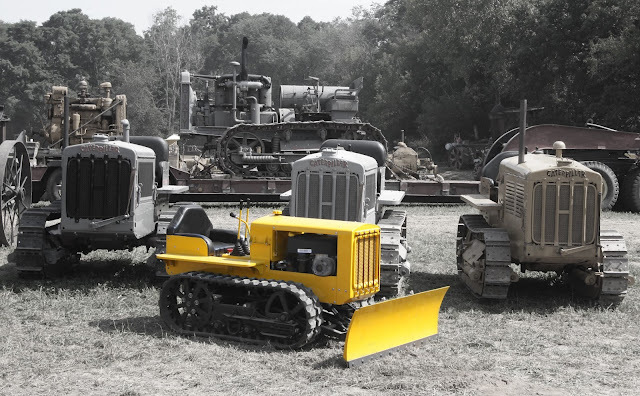 The Rock River Thresheree in Edgerton Wi hosted the annual Antique Caterpillar Machinery Owners Club show this year. I have never been to this show before and I've never been to an ACMOC event. So far, I have to say it was the best show I've attended to date. The show had a lot of variety including a steam driven pile driver, a couple of dragline shovels, a big "sand box" for all of the dozers, graders, shovels etc and a steam locomotive that runs around a 1.5 mile track to name a few things. But on top of all that, I was able to meet a lot of great people from the club and see a good amount of vintage Caterpillar equipment. So I took my sons little dozer around and snapped a few pictures next to the big boys. Click on the picture below to see more from the show.